It’s been a long time since I last wrote, but hey, I’ve got a lot of important dog things to do. There’s sleeping and eating and playing with my bestest friend in the world Indiana Bones. We’ve been trying to keep Mr. Squirrel out of our yard and the other night Indy jumped over the low wall in our garden and treed him! Indy was jumping up trying to climb the tree so he could tell Mr. Squirrel to find some other digs. He jumped so high! But then Indy is a Belgian malanois and has super long legs…. Personally, though, I think Indy is getting a little too serious about scaring off Mr. Squirrel. I secretly hope he’s unsuccessful because I just love any excuse to run crazily around the yard barking for all it’s worth and being on intruder alert lets me get away with it. Ah spring, where art thou? I’ve had enough of these rainy days. I don’t mind splashing through puddles and getting a little muddy, but I’m longing for a trip to the beach with my mommy. It’s wonderful riding in her convertible with the wind in my face. 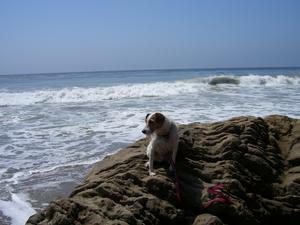 This photo shows me on a big rock when we went to Ventura. I enjoyed following the crabs as they ran across the sand and breathing in the sea air. Best of all was riding mommy’s Boogie Board. We would wade out until it was too deep for me and then she would scoop me up and set me on the board. We would go out a little further and then wait for just the right wave and wooosh! I would be off, surfing my way to the shore. I made my mommy take me surfing over and over again until she was tired. Then we sat on the beach and had a snack. Mommy wrapped me in a towel and hugged me until I was warm and dry. “Hey, let’s go get some more waves!” I’d tell her and eventually she would take me out again. Mommy shared a card with me that she received from the Light Bringer Project. This is the same charity that sponsors the Occasional Pasadena Doo Dah Parade. They provide art and arts education programs for children and the mentally ill.
One program that they have been working on has finally come to fruition. The international network of ROOM13 creative studios has been joined by Eliot Middle School in the Pasadena Unified School District. Kids there will now be able to explore and participate in a range of art projects and share their creativity around the globe. Keep happy, spread the sunshine and the love.